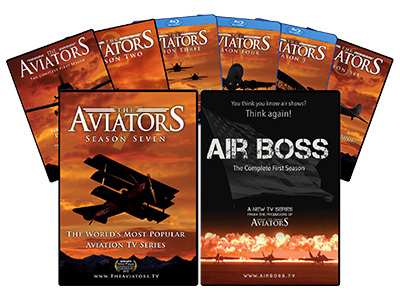 Enjoy All Seven Seasons of the world’s most popular aviation TV series. It’s action, intensity, and adrenalin mixed with education, entertainment, and beauty. The Aviators is all-things aviation – for everyone who has ever gazed skyward. We visit Canada’s largest airport to look at the technology that drives air navigation systems. Then we look at one of the most affordable ways to own and enjoy an aircraft – ultralights! Part thrilling, part insanity, paragliding is one way aviation nuts get into the open air using a contraption that fits in the back of your car. Then we look into the science of applied aerodynamics. Air Rally 1 – We accompany dozens of aircraft and pilots as they island hop in the Caribbean during this 2 week aviation odyssey. Air Rally 2 – The Air Rally continues as the group is met as heroes country after country. That is, the ones who actually make it! We visit the world’s most famous aviation university to explore it’s storied history, many milestones, and future developments which include (get ready for it) flying cars! Then we look at arguably the most versatile little aircraft ever made – the Pipistrel Sinus. Anthony flies a simulated Cessna directly into a thunderstorm which would be certain death in real life, but not until he flies a full-motion airliner sim into one – so violent even in a sim that we may have even broken the $20 million unit! PT-19: Wayne Boggs introduces us to his historic P-19 trainer aircraft. 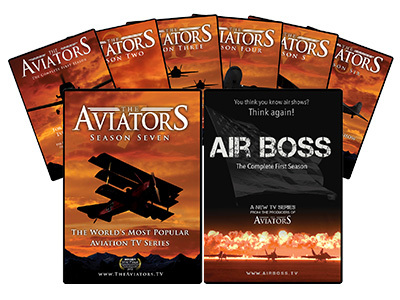 AirVenture: America’s largest aviation celebration. C5M: A look at the US Air Force Supergalaxy. Tiger Moth: A challenging wartime trainer biplane. Jeff Skiles: Kurtis and Sara speak with one of the Miracle on the Hudson heroes. Flat spin: A pilot’s tells us about his “unrecoverable” mishap. Chartright: Corporate charters are all about flying in style. Cross Canada Century Flight: Over 100 aircraft fly coast-to-coast to commemorate 100 years of flight. Julie Clark: Kurtis interviews the pioneering air show performer. Affordable helicopters: A look at small, personal rotary-wing aircraft. Cessna: Anthony explores the legacy of the Cessna brand. Float Planes: We take a look a year-round seaplane training on the west coast. Landing an Airliner: Airline captain, Jeff, shows us how to land a heavy! Patty Wagstaff: We catch up with the aerobatic champion in Florida. MiG 15: We learn about this classic Russian fighter. Sun ‘n Fun Special: We pay a visit to Spring Break for pilots in Lakeland, Florida. Can a Private Pilot Land an Airliner? : Anthony lives out this fantasy scenario. How does he do? Delfin L-29: A look at another eastern fighter. Aircraft Annual Inspection: The practically essentially and legally necessary process of keeping all aircraft safe regardless of vintage. Airbus A380: Sara gets a tour of this massive new airliner. Can a Non-pilot Land an Airliner? : In this third segment of our simulator series, a non-pilot attempts the impossible! Portable Collision Avoidance Systems: We tinker with inexpensive gadgets by Zaon that help private aircraft stay safe. Women in Aviation: Sara interviews the president of an organization that provides scholarships to young female pilots. Light Sport Flying: A look at the fastest growing sector in aviation today. Air Traffic Control Tower: An inside look at one of the most technologically advanced towers in the world. Walkaround Checks: Kurtis tests his pre-flight inspection skills. Quesnel Air Show: After having seen some of the larger air shows, we visit a smaller and more quaint one. Pilot Profile: John tells us about his growing up with an interest in aviation. Rick Volker: Sara interviews the air show performer during the off-season to talk about spring conditioning. Homebuilt Industry: How handy aviation enthusiasts use their skills to build their own aircraft. Cessna 208: A look at the Caravan – the pickup truck of the skies. Mid-Continent Instruments: Making precision aircraft instruments with lifesaving features. En Route Control: Most air traffic control does NOT take place in a tower but rather in an area control center like this. Boundary Bay Air Show: A popular local show at the season one home of The Aviators. Beech Staggerwing: An aircraft profile on the one time ultimate executive aircraft. AOPA: A look at the important role of the Aircraft Owners and Pilots Association. Aircraft Auctions: Getting a bargain while purchasing aircraft in a unique and fast-paced way. Ultralight Flying: Arguably one of the most visceral flying experiences there is. Aviation Destination – Wichita, Kansas: We visit the Air Capital of the World. Mikey McBryan: Anthony chats with the star of TV’s ‘Ice Pilots’. Goodyear Blimp: Kurtis takes a memorable flight aboard one of Goodyear’s famed slow-moving giants. Midnight Sun Challenge: A group of pilots fly into the Yukon. Day in the Life of an Airline Pilot: Raeleen shows us what a typical day is like for her as an airline first officer. Airline Environmentalism: Green efforts airlines are taking to improve efficiency. Airliner Maintenance: Routine maintenance airlines perform to keep their fleets running safely. Cross Border Flying: Anthony flies the 206 from Canada to the United States and checks in with Customs. 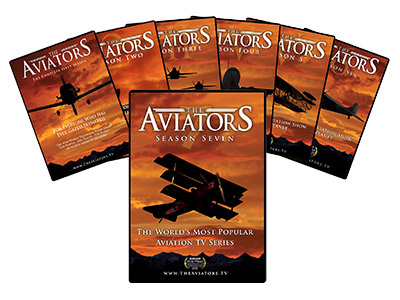 Robert Gannon: Robert speaks to Anthony about his remarkable story of flying a Cessna around the world. Splash In: Sara visits a fly-in dedicated to seaplanes.